Speed draws a crowd, whether you're a "car guy" or not. When the competition is neck-and-neck and the camera can barely keep up, it's hard to look away. That's why you know the Indianapolis 500 even if you're not an ardent follower of INDYCAR. You don't need to like NASCAR to know about the Daytona 500, and even if you have no idea what endurance racing is, you can associate "24 Hours of Daytona" and "the 12 Hours of Sebring" with "Paul Newman" and "Steve McQueen." 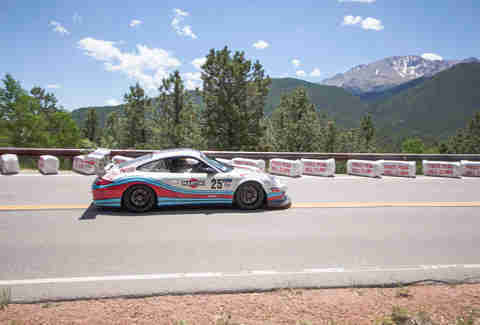 Then, there's the Pikes Peak International Hill Climb, or PPIHC for short. Unless you're into cars, I bet you've never heard of it. That's a shame, because it's absolutely one of our nation's greatest races. 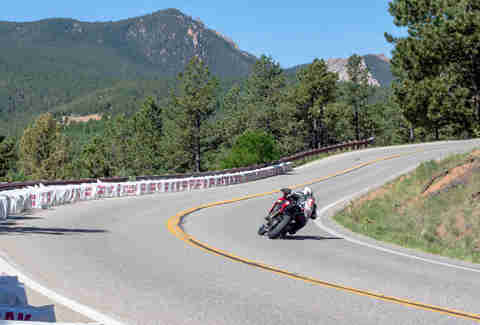 Pikes Peak is a hill-climb race, a one-way journey up a mountainous, 12.42-mile course outside of Colorado Springs. With 156 turns, the race culminates at the mountain's 14,115ft summit. Think of Pikes Peak as North America's version of the legendary Nurburgring. 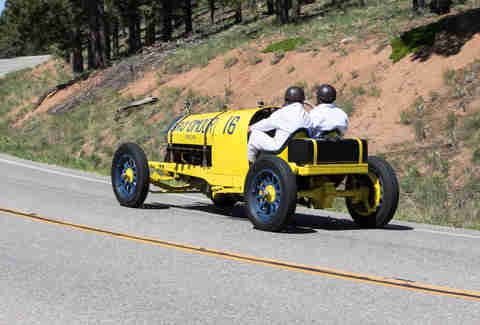 In 1916, the very first race up Pikes Peak was designed to show off the power, reliability, and performance of the day's competitive cars. Today, the extremely dangerous course remains nearly the same as it was a century ago: virtually without guardrails, winding toward an altitude where the air is extremely thin. 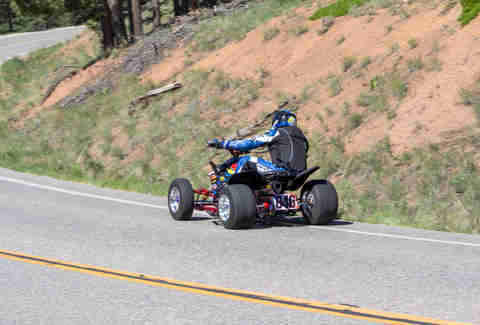 There have been numerous crashes during attempts to set record times up the mountain, and even a few deaths. The fastest time yet recorded at Pikes Peak was Sebastien Loeb's at 8:13.878 -- eight hair-raising minutes of driving at the edge the car's capability along the side of a cliff. Competitors have one shot to make it happen, after just a few days of practice. That's it. No do-overs -- except in the case of another competitor's accident on the course. The spectacle of Pikes Peak is chronicled fully in Climb Dance, a short film with jazzy undertones that shows the death-defying stunt work necessary to conquer the mountain in the days before everything was paved. If you haven't seen it, set aside the five minutes. 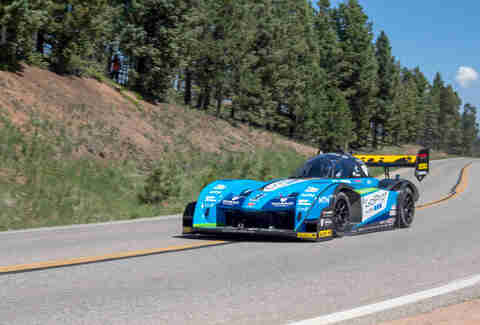 At Pikes Peak, anyone can compete, and anyone can be a winner. Unlike professional racing, the best part about Pikes Peak is that successfully climbing the mountain can turn an ordinary individual into a hero. Even the winners are largely anonymous. There is no Steph Curry of hill-climb racing, nor are there surplus Juan Pablo Montoyas. This year, I stood for almost 10 hours at the same corner (nicknamed Crystal Cove). You don't know fear until you've waited behind a crude guardrail as a vehicle hurtles straight at you at 110mph. It's impossible to know if the drivers will hit the apex and make the turn. Some don't. Most, thankfully, do. You don't have to be on the starting grid to appreciate the variety of competitors, but it definitely helps. Motorcycles start the race, followed by three-wheeled sidecars, with four-wheeled cars and trucks bringing up the rear. The greatest spectacle is watching the sidecar co-driver dangle alongside, hanging on for dear life while making sure the trike gets around the corner properly. This year, Honda and Acura amazed with three race-prepped variants of the NSX, including the totally electric four-motor EV. Some of these competitors are straight-up certifiable. Toward the end of the day, which stretched from 7am to about 4pm, a modified Freightliner hauled up the hill, spewing diesel smoke everywhere. So why have you never heard of it? 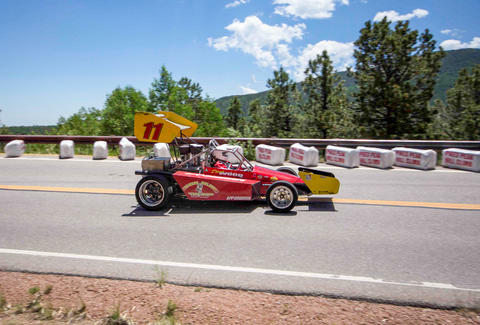 Despite the self-evident righteousness of the Pikes Peak event, hill climbs are more of a European style of racing that never fully caught on in the US. 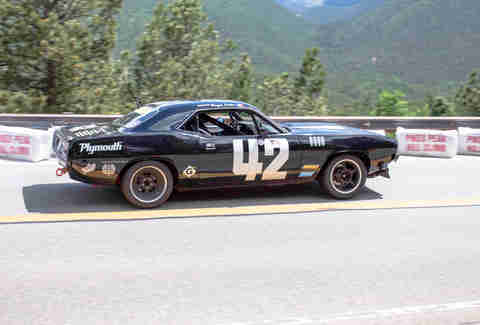 Plus, the Pikes Peak hill climb has always been overtly dangerous, which makes larger corporations a little skittish when it comes to sponsorship and participation. As a result, there's no one series of which the PPIHC is a part, as is the case with the 24 Hours of Daytona, the Indy 500, etc., which further reduces participation of the headline-grabbing drivers. As for fans of the race? Only so many people (like yours truly) have the guts to stand along the twisting road as it goes up the mountain. And so it is that you've probably never seen or heard of the Pikes Peak hill climb, despite a century of history. Even though no one has heard of this thing, these racers are gods in certain enthusiast circles. I was fortunate enough to join the reigning King of the Mountain, Carlin Dunne, who set the current two-wheeled record in 2012 at 9:52.819, for breakfast along with fellow racer Micky Dymond. You might not have their posters on your walls, but both these guys are considered legends in any competition. In fact, toward the end of our meal, the cafe owners recognized them, came over with markers and a poster, and asked sheepishly for autographs. When the server handed me the black Sharpie, I was at once humbled and humiliated. I may have had the guts to stand on a corner of Pikes Peak, but there's no way I'm ever going up that thing on two wheels. Jeff Jablansky is a contributor to Thrillist Cars. He struggled for breath on the mountain and persevered for 10 hours at the same corner for photos. Follow him @unclewithcars.